Have you ever seen a palm tree that has a big elephant trunk? That is the rarely seen african wine palm. It is a sort of tall arbor, and it could grow as tall as 25 meters. When it grows to 10 meters tall, its thickness is about 40 cm and a peculiar anthotaxy would grow out on its top, which could be as long as 2-3 meters. 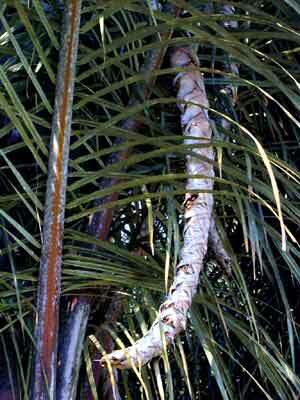 The anthotaxy is thick and bended, like the trunk of an elephant; and the palm gets its Chinese name from it. African wine palm blossoms and fructifies once in its lifetime, then it would wither away completely. African wine palm only has a lifetime of 20 years, it is a variety rarely seen among all vivacious plants. African wine palm is also called "coco of liquor", because its anthotaxy contains large amount of liquids, which could be used to distill palm liquors. The fruits of african wine palm palms are very beautiful. They are of golden yellow and very bright, like a painted pinecone, and we could even say it is a natural craftwork. African wine palm has its native land in the tropical Africa, and it has been transplanted in China. It is an ornamental plant and its leaves could be used to weave house ware.